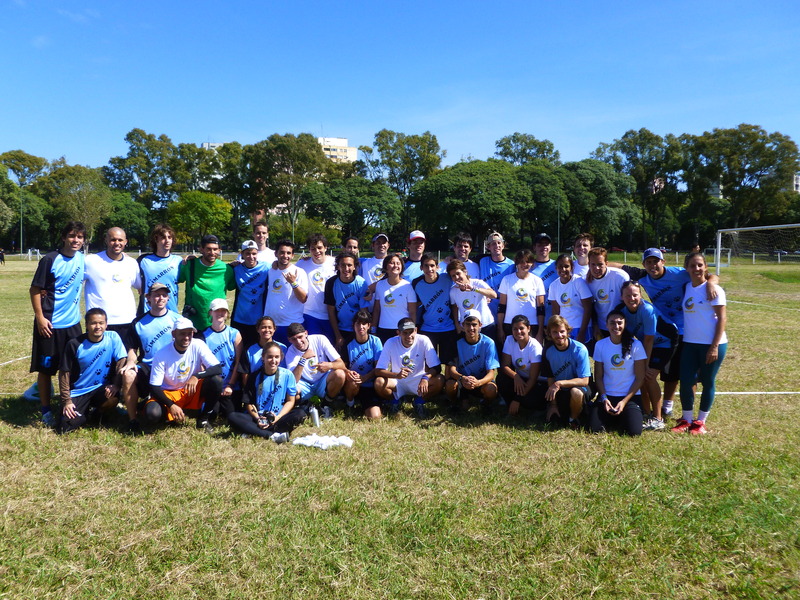 We were in Buenos Aires a week and a half ago for the biggest ultimate frisbee tournament of the year in this part of the country. Asa and I met the rest of the team at a hostel in the center of the city shortly after they arrived on wednesday afternoon. It was an awesome hostel; close to all the major tourist attractions in the downtown area, they served breakfast, and always had hot water for the showers. 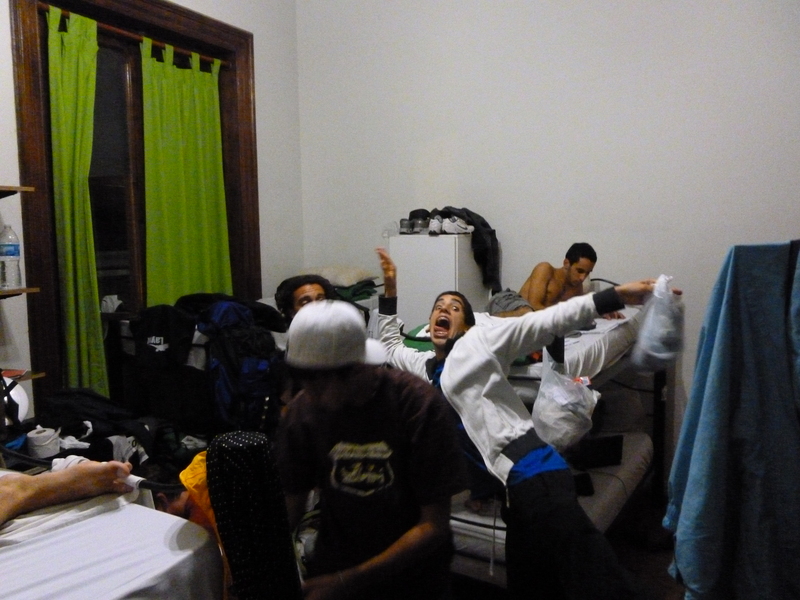 They were also able to fit all of us into two rooms! The tournament itself was held at Parque Sarmiento on the west side of the city and about an hour travel from our hostel via either a subway and bus ride or a train and walking. The tournament schedule had clinics on thursday designed to help players with their throwing and defensive skills. It was run by some of the organizers of the tournament. There was also a clinic designed to discuss spirit of the game. They discussed things like interpretation of the rules and how to deal with disagreements on the field in a sportsman-like manner. A much greater focus is placed on spirit of the game and camaraderie here than in the United States, although it still forms the foundation for the sport in the states. Thursday ended with two showcase games; one women’s and the other men’s. The women’s showcase game was played between the first (and only) women’s team from Buenos Aires (formed last August) and the rest of the girls from the tournament. This gave the Buenos Aires team a chance to play together and start figuring out how to work as a team. 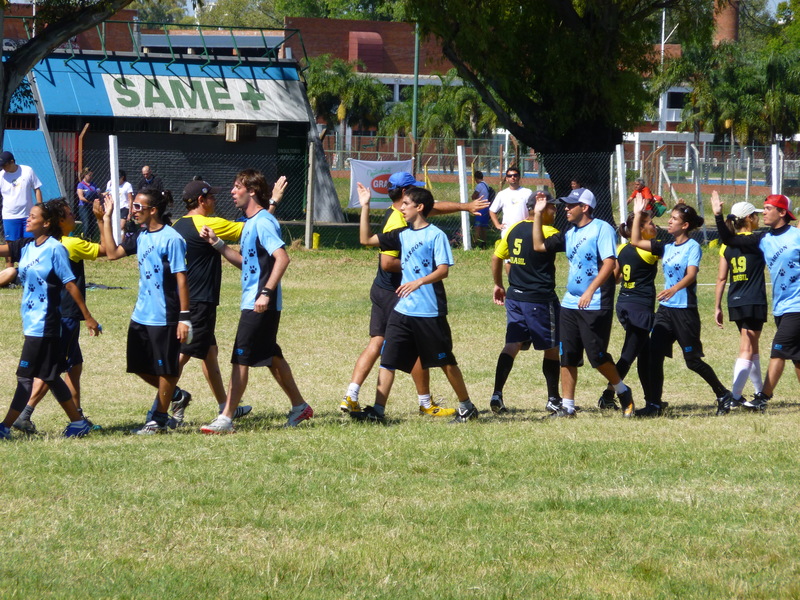 The men’s showcase game was between the Argentinian men’s team and 2-3 all-stars from each of the other teams. 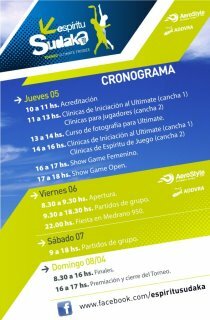 The Argentinian team will be attending World’s this summer in Japan. I played in the women’s game and Asa, Juanma, Cabra, and Juan Diego played in the men’s game. Friday and Saturday were pool play days. There was one pool of 5 teams and one pool of 4 teams. The team from Colombia had some travel troubles and had to stay home at the last minute, hence 9 teams instead of the planned 10. We drew a spot in the pool of 5 and had to play Brazzinga (the top team from Brazil) in our first game. It took us a bit to figure out what we were doing and managed to keep the score fairly close. It was a hard game to have first and we ended up losing. Our second game of the day was against the Cadillacs, a team from Beunos Aires. We worked together really well, with everyone getting good play time and we won. This was the first game that Cimarrón has won as a team!!! Saturday started out with a game again Del Rial, or the mustachios. They all had drawn on mustaches and were giving gifts of stick-on mustaches. This was a hard game to have first in the day. They had picked up a couple of the Columbian players that happened to make it to the tournament. They were young and fast and moved the disc really well. We tightened things up a bit and made some strategy adjustments and won Cimarrón’s second game!! Our second Saturday game was against a team from Chile. We rotated everyone through the lines and tried a little zone. Cimarrón won it’s third game!!! This was enough to put us second in our pool and in a cross-over quarterfinals game against the Bahía Blanca team. This team consisted of people from Monte Hermoso where Matt went to play the beach tournament in February, so he knew most of them. The game was a bit rough with calls and was more aggressive than any of our previous games. We stuck with it and Cimarrón won it’s fourth game!! That put us into the semifinals Sunday morning against Big Red, Buenos Aires’ best team and the team that had won the tournament last year. We came out ready to go. We started playing a zone defense with two ladies in the cup and were able to shut down their offense for a bit. We were down for most of the game and brought the score back to 10-10 with us on defense. We threw our zone and got a turn. Asa sent a deep shot to Juanma who was wide open. Juanma ran toward the back of the endzone and tried to “toe” the line, but to no avail. We set our zone again, but Big Red managed to work the disc all the way back up the field and score. Cimarrón lost the semifinals by one point. We still had the third place game to play against Sol, the other Brazillian team, but we had worn ourselves out playing Big Red. Cimarrón lost the 3/4 game, racking in a fourth place showing at the tournament. Cimarrón’s end record was 4 wins and 3 losses, a remarkable tournament for the team and all of it’s players! Other players and teams continually commented on the improvement in Cimarrón’s players and team strategy from last year’s tournament. There was also a general excitement that Uruguay was building it’s ultimate program and actively seeking ways to improve and participate in the region. Cimarrón also managed to get some awards at the end of the day: Asa won male MVP for the tournament and Randi won Defensor Feminino. Thanks needs to be given to the organizers of the tournament for a great show. Also, thanks to all of you on the blog who have been with us from the beginning, providing financial and emotional support for the team here in Uruguay. The tournament was a great culmination of two months of hard work and there’s no doubt that Cimarrón will continue to improve and participate in future regional events! Thanks again! 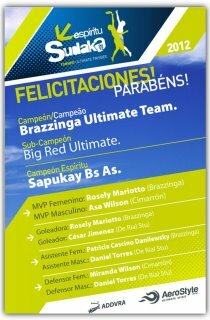 This entry was posted in Travel, Ultimate and tagged Buenos Aires, Cimarrón, Espiritu Sudaka, frisbee, Parque Sarmiento, Ultimate, uruguay by mlwattsupp. Bookmark the permalink. the story has all the makings of a hollywood movie. congrats on all your hard work.